Timbeter is making the forestry industry more transparent, sustainable & efficient. The most accurate and easy-to-use mobile platform with cloud storage, online inventory & reporting for easy adoption. 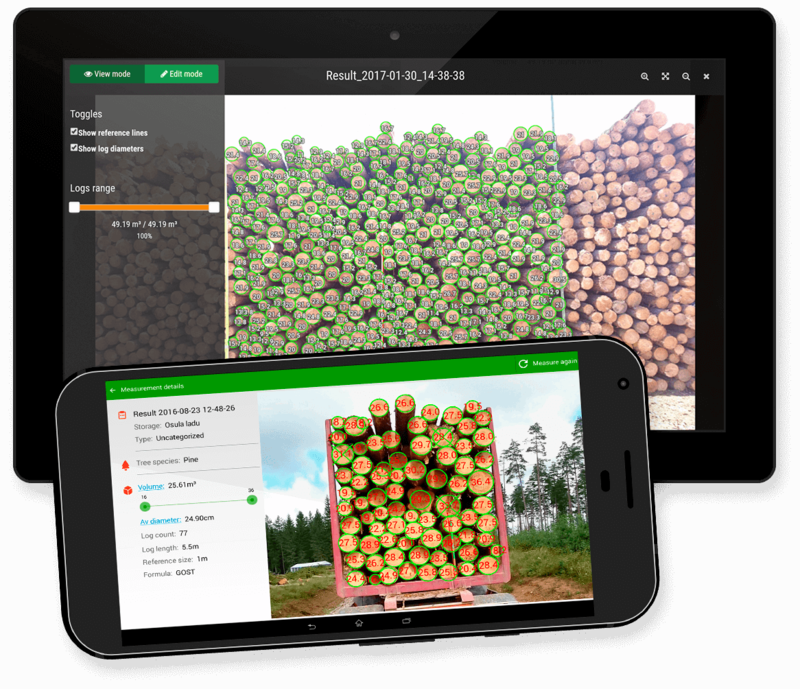 Using image recognition and machine learning technology, Timbeter is creating the world's largest database of photometrically scanned timber logs. Measured more than 20 million cbm! Take a photo with Timbeter of the timber whether in a pile, on a truck or in a container. If your pile is too large for single photo, then use the panorama setting. Timbeter determines the number of logs, volume and diameter of each log. You can filter the diameters to see how many logs are in the specific range. Every pile has is geotagged that makes tracking the timber’s origins easier. Every measurement is stored in a cloud providing a real-time overview of measurements related to their species and qualities. Timbeter enables you to re-measure every pile in the web should you need to. Timbeters’ storage enables you to analyze and share your measurements quickly. You can view inventories, active storage statuses and create instant reports in a few taps of a button, aiding managers and accountants to remain informed and up-to-date. Timbeter allows users to have a greater control over their measurements, as all the information can be easily audited and controlled. The digital data can be shared between parties. Our pioneering mobile platform, built for easy adoption. Take a photo of the timber pile with your smartphone or tablet. Our app does the number crunching (GPS, log count, volume, diameter, average diameter). Measurements are transferred and saved in the cloud for real-time data on inventories. Shipment can be traced precisely throughout the logistics chain. BE MORE ACCURATE Photo is highly accurate compared to manual measurement. GET YOUR TASKS DONE QUICKER Photo can count logs in 3 minutes or less, unlike manually measuring logs. BE MORE TRANSPARENT Obtain digital measurements, so both buying and selling parties can check volumes. TRACE YOUR LOG SHIPMENTS Find out where the timber logs originated, and where they are shipped to. GO GREEN AND BE PAPER-FREE No need to record measurements on paper, all done in one photo and can sent to others in a few clicks. ERADICATE ILLEGAL LOGGING Measurements are digitally recorded with the option to save geo-location to the photo. Making forests more sustainable. BE MORE EFFICIENT Accurate, faster, digitally recorded timber measurements enable users to get a better price for their timber by doing less work. “Timbeter measures our production on a timely and trustworthy way and contributes naturally into digitalizion of our business." "It is a great app and has professional "hands-on support" by experienced professionals who know the industry and technology." "All the measurement process is quicker and smoother. And I can sleep peacefully during the night." With our first measurement, we saved €400 because of its accuracy compared to manually measuring timber logs"
"With Timbeter we have operative information that enables control on receiving logs, visual proof in the storage module, to evaluate quality of measurements and to minimize human error." "The more I explore Timbeter, the more improved it seems to be. Usually, European companies don’t pay so much attention to the details as Japanese do but this is different in Timbeter’s case." "Timbeter greatly improved efficiency by removing the long and labor-intensive process of hand measuring every log and transferring that data into digital form. This application and supporting dashboard have allowed us to streamline the most cumbersome and time-consuming aspects of timber export while improving safety and employee/customer satisfaction." Timbeter is a modern easy to use tool for timber measurement and forestry management. Photo, measure and analyze your timber. Keep your forests and containers in order. Get insight on forestry efficiency. Click on the ‘Sign up’ button. After signing up and adding your company details, download the app on iOS or Android and watch the short tutorial. Then take your first picture, adding in the log pile details. Remeasure if required, then send and share your measurements with others. For that, follow the instructions in the app. You can make up to 10 pictures free or apply for a 7-day unlimited trial. The cost depends on how much you use Timbeter for - we have a price per picture or you can unlock more unlimited features in our annual or monthly subscriptions. Yes, Timbeter currently incorporates over 15 different formulae (including JAS, GOST, Scribner). However, since different countries have their own standards of measuring timber, then if you do not find your formula or standard of measuring in our platform, then do reach out to us. Timbeter does not require any local hardware, only a Android or iOS smart device (mobile phone or tablet). Timbeter works on any computer and browser. For editing measurements in the Storage Module, Google Chrome and Microsoft Edge are required. Is Timbeter faster and cheaper than manual measuring? Yes, very much so. Each pile of logs can be measured for pile density, log diameters, and the number of logs in 3 minutes or less - saving the measurer not only time saved, but obtaining accurate measurements to get a better price for your timber logs. How to get started with Timbeter?